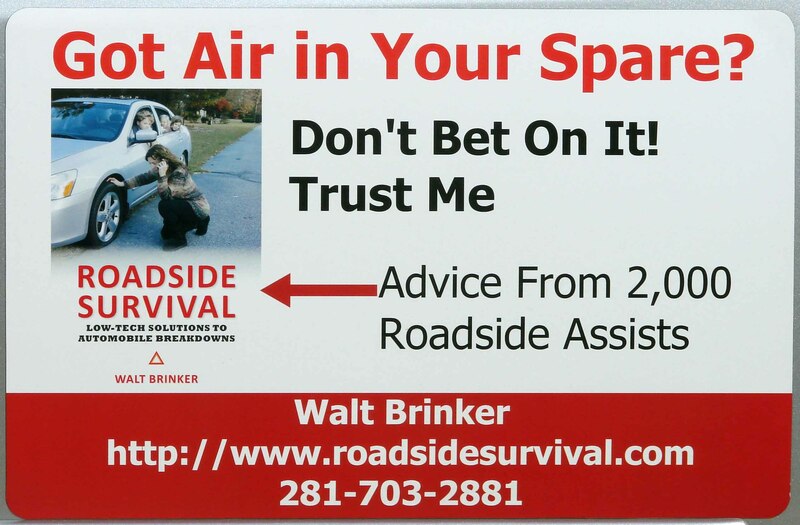 With experience now from over 2,000 free-of-charge roadside assists as a hobby, I have a website which includes information about my new unique book, “Roadside Survival: Low-Tech Solutions to Automobile Breakdowns”, as well as other related material. Please check it out, and if you like it, pass the link to others. The book is designed to empower others to prevent and contend with vehicle breakdowns. My bet is that you’ll find it useful and interesting. Still saving the world one broken down motorist at a time! Check it out; tell me what you think. Walt, had your book existed at the time it would have been required reading for my three sons. Your emphasis on tires is right on…they are often neglected until it is too late. Good job. Your sons will never be too old to benefit from the book. Most folks I stop for are adults. My 10-year old grandson spotted a copy in my car, asked for his own, and has read the book – understanding it! Hello Walt, loved the on air press about you. I just wanted to let you know, you don’t need the long jumper cables. I bought a self-jumper from Lowe’s Home Improvement I think. You charge it up and then you just carry it over to the car in need hook up the cables to the car and jump it. No need for another car. I bought it for myself because I have gotten stuck when no one else was around to jump me, so I carry it in my car, but I have ended up using it many times for other people in parking lots mostly Walmart parking lots where you can’t always park conveniently to jump someone off. Also it’s easier than having to hook up your car. The self jumpers only run $50 – $65, fyi. Good info. Thank you. I carry a portable jumper battery mainly to power my 12-v compressor for low tires, but it also works on other cars. Until I got my JNC660 jumper battery, my jumper usually was too weak to jump a large engine with a dead battery; so I’d use my cables. Cables are the best way still to charge another car’s dead battery. My family was more of the ones that Walt helped, he is one of the last of the good guys.. Broke down in the hot summer sun on the side of the road with an 18 month old baby and no one stopped until Walt came by.. Worked hard to get us back on the road and then to get a wrecker to have the car towed..
On May 20th, 2017 my family was traveling in two separate vehicles on I 95 North. We were headed to the NCAG Fair in Raleigh. My son called us and said pull over, he thought his tire was going flat. I looked for the problem, but couldnt find it. Mr. Walt Brinker pulls up and offers to assist. This man is a Purple Heart recipient from the Vietnam era, and he jacked the car up and handled business like a pro. We offered to give him something for his services, but he kindly refused and said for us to pay it forward. People like Mr. Brinker are Very Hard to find. He was Very Kind and gave us some very important tips before we all left. We cannot Thank You enough Mr. Brinker !!!! We look forward to purchasing your book !!!!!! Again, thank you for that generous comment. I never imagined that our first encounter on I-10 would lead years later to a shared segment with you on Houston TV. Part of my focus now, considering the all-too-common toxic relations between police and those they protect, is to convince police to try to win hearts and minds by performing, when priorities allow, simple, safe, quick roadside assists. Part of my plan includes training officers using this video: https://vimeo.com/200599109 (see also this website’s page on Law Enforcement Roadside Assisting). This approach would help folks see police as angels worthy of cooperation to prevent and investigate crimes. BTW, I have revised my book to include several nuggets and lessons learned since the book’s 2014 introduction. The updated book has been available since early this month. I’m not an LEO, just your average civilian with aptitude and interest in the mechanical. I make sure my lug nuts are torqued to spec; I ask the tire shop to torque them by hand, and they do. The only time I couldn’t get lug nuts off was on a ’72 Dodge – Did you know that Dodge had left-handed lug nuts on the driver side that year?? I sure didn’t… but my husband did, from watching, believe it or not, the Dukes of Hazzard! I have many of your recommended tools in my trunk-not all, because it’s a small trunk, but I’m pretty well equipped. My husband (A professional mechanic, and a good one; They’re not always synonymous!) gave me a 12 inch square of diamond-plate steel for my jack pad. Yes, I check my spare regularly; just not as often as I check the other 4.